They are the number one “organic” search result for this search! Their listing takes up all the space above the fold and below the premier Adwords listings at the top of the page. Their listing includes all the pertinent information about their dental practice: name, address, phone number, website URL, Google map and directions! The dentist’s picture is shown next to the listing, along with the name, address and phone number for his practice. 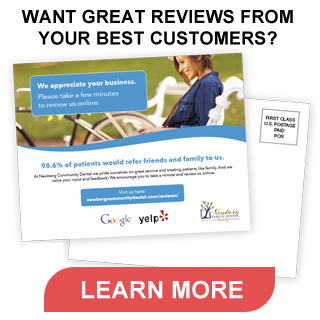 The dental practice has 28 Google reviews, with a score of 28 out of 30. They have even more reviews on Demandforce.com and CitySearch.com. One person on Google+ rated it excellent. The search phrase “dentist in north plains” gets only a few “long tail” searches per month. But consider that anybody who lives in North Plains, Oregon and is looking for a new dentist will see this on Google when searching for a local dentist. That means hundreds of potential new patients each month who see the listing. Next, consider that the first “organic” search result on this page will probably get 75% or more of the total clicks available. That means 10 or more people who become new patients each month because of the excellent exposure this search result provides the dental practice! Finally, consider that one new patient for a general dentist is worth at least $500 per year in revenue. And that doesn’t even include potential referrals this new patient could bring to the practice. The math is simple: 10 new patients each month times $500 equals $5,000 per month very conservatively. This dentist’s campaign is generating dozens of new patient leads each month. Cost per new patient acquisition is well under $100. Brand recognition within the local market is second to none. And best of all, there’s no cost per click cost; this is pure SEO traffic. The positive ROI on marketing investment is simply amazing; by investing in ongoing website content development, search engine optimization (SEO) and reputation management, this doctor has literally captured his local market online!